Instead of that news, we talk about the Green Bay loss and everyone's insistence to make sure nobody is panicking.There was a lot to be frustrated about in the loss to the Packers. Adam narrows it down to penalties in the first half leading to points for the Green Bay offense early. 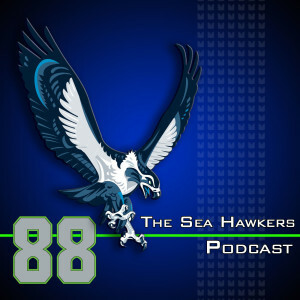 We talk bout how Jimmy Graham did not get involved in the game, and how we interpret play calling versus play execution and how it might dictate where you want to send your waves of frustration toward. After an 0-2 start, the Bears are looking like the perfect team to get the Seahawks back on track. Chicago is giving up tons of points and yards on defense, the offense looks to be without Jay Cutler and the backup did not look great against the Cardinals. Now they have to come into Seattle and deal with a crowd that will be fired up for the home kickoff of the 2015 season. How do the head coach and offensive coordinator work together? We answer that along with other emails. Brandan goes in defense of Kam Chancellor and anyone that considers his behavior childish. Adam goes on a rant about everyone coming to the defense of Andrew Luck, when nobody seems to do the same for Russell Wilson. Better at life nods go to Chris Boreland, former 49ers linebacker, a guy who has a story that continues to interest us even after retirement as well as a nod to whoever decided to listen to us about putting in cameras as part of the pylons.